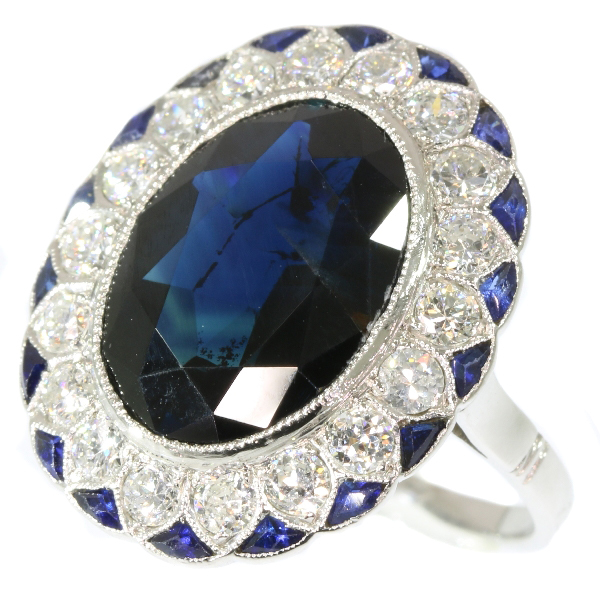 The ultimate Art Deco diamond and sapphire engagement ring model Lady Di: Description by Adin Antique Jewelry. From the first glance, it’s clear that this Art Deco platinum engagement ring from 1920 emanates nobility. In resemblance of the Lady Di ring, the deep blue of a natural oval cut sapphire springs from between 18 surrounding old European cut diamonds set in petal shapes. A second layer of 18 leaflets pops up from behind the diamond flower in the form of triangular cut sapphires, which gives this jewel the appearance of completion. Looking at the meticulously pierced base, this ring is truly created to make a princess bloom like a bluebottle in early summer. engagement ring - Especially in Western cultures, an engagement ring is a ring indicating the that the person wearing it is engaged to be married. In the United Kingdom, and North America, engagement rings are traditionally worn only by women, and rings can feature gemstones. In other cultures men and women usually wear matching rings, which can be plain. In some cultures, engagement rings are also used as wedding rings. Diamond(s): 18 old European cut diamonds with an estimated weight of ± 1.08ct. (colour and clarity: F/I, vs/i). Total diamond weight: approx. 1.08 crt. Treatment: most probably heat treated, natural sapphires are commonly enhanced by a thermal process. This is an accepted technique as long as it is mentioned by the seller. 18 triangle cut sapphire . We did not check if the sapphire is lab produced or not as this information has no influence on the value of this jewel. Natural sapphires and lab produced sapphires were both used in this era, rather more for their effect than for their intrinsic value.